Who doesn’t love a sundae? 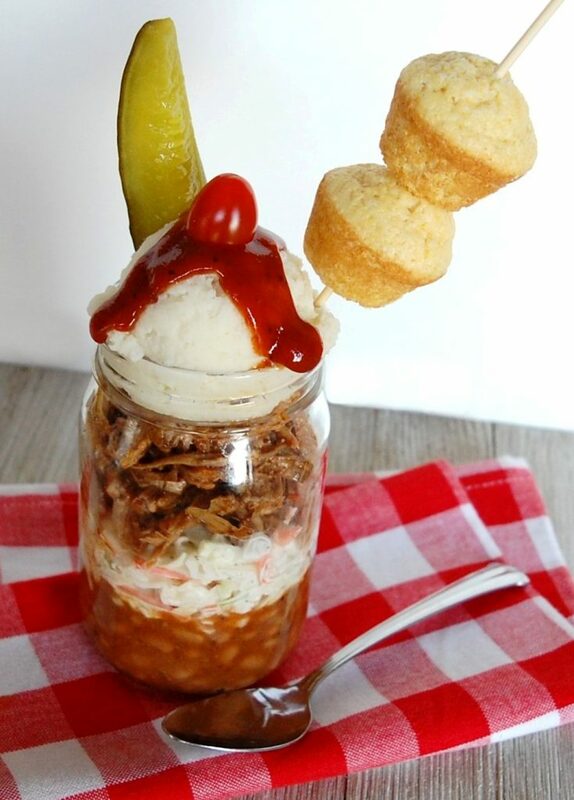 Simply layer baked beans, coleslaw, pulled pork and mashed potatoes into mason jars. Drizzle with barbeque sauce, top with a cherry tomato, mini cornbread muffins and a dill pickle spear! Perfect for tailgating, a backyard BBQ or April Fool's prank! 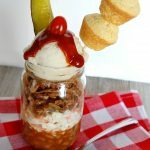 PULLED PORK: Start your slow cooker early in the morning or the day before assembling sundaes. Trim the fat from roast if necessary. Rub roast on all sides with Dan’s Sweet and Spicy Rub or your favorite rub and place in the slow cooker. Pour beef broth around the roast. Cover and cook on LOW for 8-10 hours or HIGH for 4-6 hours. Carefully remove meat from liquid reserving the liquid. When cool enough to handle, shred the meat, pulling through it with 2 forks in opposite directions. Stir in enough reserved cooking liquid to moisten, and Stubb's BBQ sauce to taste. GARLIC MASHED POTATOES: Boil potatoes in water until tender. Drain potatoes well. In mixing bowl combine potatoes, garlic, butter, pepper, salt, and cream cheese. Whip with an electric hand mixer until smooth. Add milk if needed. BAKED BEANS: Heat beans in a small saucepan over medium heat. Add Stubb's BBQ sauce to taste. Reduce heat to low and keep warm. COLESLAW: Pour coleslaw mix into a large bowl; set aside. In a small bowl, whisk together mayonnaise, sugar, vinegar, and celery seed. Pour dressing over the coleslaw, toss to combine; season with salt and pepper to taste. Refrigerate until ready to assemble. TO ASSEMBLE: Scoop a 1/2 cup each warm baked beans, chilled coleslaw, and warm pulled pork into four 16-oz. mason jars. Top with an ice cream scoop of warm mashed potatoes. Garnish with a dill pickle spear, corn bread skewer and cherry tomato. Drizzle with Stubb's BBQ sauce and serve immediately, Enjoy! COOK’S NOTE: You can make these sundaes using my recipes; use your own recipes or use store-bought for a shortcut meal. Potato Salad would be a great substitution for Mashed Potatoes if desired!